Office Assistant (Village Assistant) - 21 Posts - Basic Pay 4800 Grade Pay 1300 in Pay Band IA - 5th Std Pass - Age 30 years. 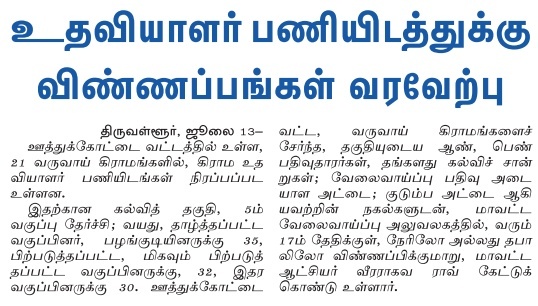 Village Assistant will be appointed for 21 villages in Uthukkottai Taluk Thiruvallur District Tamilnadu. Candidates should have a good physical body condition to run a by-cycle. Cut off date for Age and Qualifications are 1st January 2015. Short listed, candidates will be called for personal interview. Past recent passport size photo. Employment Registration Card (not mandatory). There is no official application form. Send your application form by REGISTERED POST with acknowledgement card.